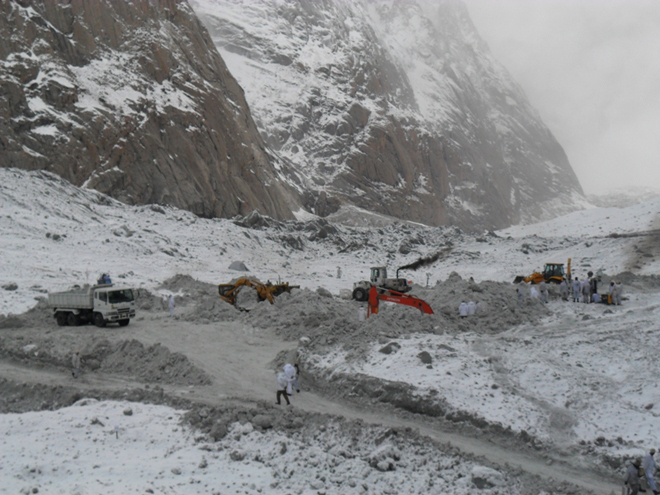 Gayari: Work on spillway is underway to discharge water that resulted due to melting of glacier in Siachen Gayari sector to rescue the army officials buried under the ice avalanche. According to the details, the water level is on the rise that has spread over to an area of one kilometer. The search and rescue operation for over a 100 soldiers buried at Gayari continued for the 23rd day. ISPR reported that the Ground Penetrating Rader (GPR) teams took readings at 26 different points and identified eight sites for further search on Saturday. Drilling at 8 different places is going on to rescue the intrepid soldiers of Pak Army who were buried by a massive glacier on the 7th of this month. So far 1.9 million ton ice has been removed from eight identified these points. According to Pakistan Meteorological Department, snowfall is expected at the Gayari Sector in the next three to four days which will hamper rescue operation. Meanwhile, search and rescue operation at Gayari Sector contunues round the clock and one kilometer long lake has come on surface due to melting of ice. This entry was posted in News and tagged Gayari, Gayari Sector, ISPR, Pak Army, Pakistan Army, Rescue oepration, Siachen, Siachin. Bookmark the permalink.